Tokyo Ghoul: re Vol. 3 Review – AiPT! The Commission of Counter Ghoul’s raid on the Ghoul auction is in full swing and with it comes tons of gory action! Tokyo Ghoul: re Vol. 3 picks up in the middle of the Commission of Counter Ghoul’s raid on the Ghoul auction and covers the entirety of the operation. There are multiple teams of characters and Ghouls in various locations on various assignments to keep up with. Does the volume deliver exciting action while keeping everything coherent? The biggest boons creator Sui Ishida grants us in this volume are the repeated pages featuring a map of the operation site that shows which characters are where. Even three volumes in, there are character names I don’t immediately recognize, so the visual element supplements the dialogue well with regards to keeping the narrative straight in the reader’s mind. As the various teams of the CCG take on different opponents, the action and horror are amped up significantly higher than in previous chapters. The series had a relatively slow start, focusing more on establishing a crime drama feel, but this volume is all about combat and blood. 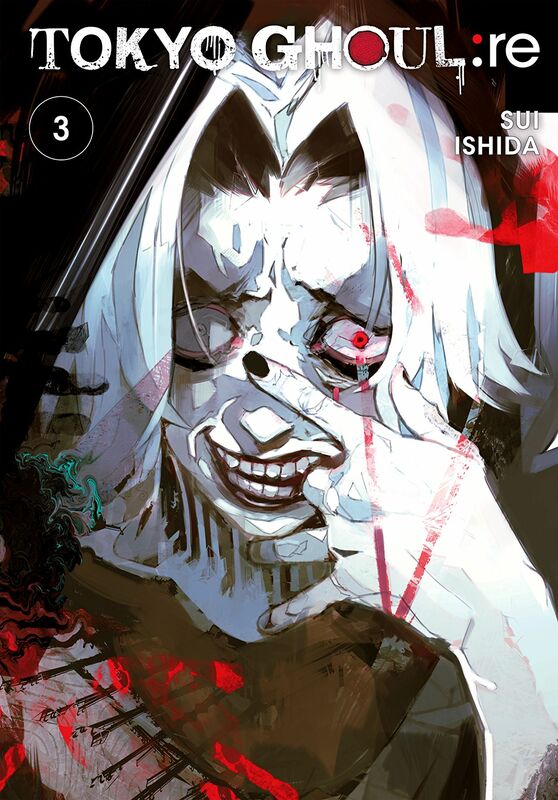 The horror elements in this volume succeed thanks to the varying line-art techniques Ishida employs throughout. While quieter scenes are rendered in clean lines that express the characters well, the more horrific a scene gets, the messier the lines become, shifting the tone effectively and making the gore all the more gruesome. The character featured on the cover of this volume is especially ghoulish and a particular panel of him eating a CCG member stuck in my mind afterward as one of the volume’s creepiest moments. Horror fans will enjoy the over-the-top gore elements of the volume both in the action-packed fights and in the quieter scenes of ghouls chowing down on overpowered CCG members. Where the artwork falters most is during intense fight scenes. I found myself having trouble distinguishing exactly what was happening in a lot of panels. Ishida uses similar techniques when showing sword swings and attacks from a Ghoul’s predatory organ called a “kagune.” This makes fight scenes hard to read as CCG members swing their anti-Ghoul weapons, or “quinques,” against Ghouls retaliating with their kagune. Oftentimes a panel will have large white sweeping blank areas representing the weapon swings, making the fights less visually interesting as well as unclear. This is a shame as the weaponry on both sides of the conflict is one of the series’ more interesting design elements. Because of the action-heavy nature of the volume, there isn’t a ton of character development in these chapters. However, this isn’t hugely disappointing given all the character work done in the earlier, slower volumes. What is much less appealing is the way the series has treated its characters who are trans and those who are presented as female but are revealed to be male. One of the main cast members is a trans man and thus far in the series he’s been presented as incompetent in combat compared to his team members, leading to him being repeatedly brutalized by Ghouls several times. All the characters in the series take a beating at some point, but this character is the only one shown incapable of fighting back thus far, leading to scenes where he is helplessly gored by his enemies. This makes me uncomfortable given the history of targeted violence against trans people in real life. There is also a character who is presented as female until they are revealed to be male after they’ve been killed, a revelation that feels random at best and linked with their grotesqueness as a deplorable villain at worst. It doesn’t help that this is the only overweight character in the volume and pairing that characteristic with their grotesque presentation as a human trafficker made for a distasteful representation of a character who presents as different from their assigned gender. Overall, Tokyo Ghoul: re Vol. 3 delivers an exciting read filled with action and gore. There are definitely some poor character choices holding the series back narratively, but aside from the those I enjoy seeing the CCG teams go all out after all the slower build-up from the previous chapters. This volume delivers exciting, horror-filled action, but some unclear artwork and poor character choices hold it back from being really great. After a couple slower volumes, the action and plotting are exciting and fast-paced throughout. The character and weapon designs are always visually interesting and make the series feel unique. The amped-up horror elements are effectively disturbing and expertly rendered. Fight scenes often became unclear due to the similar techniques used to depict weapons swinging. The main cast's trans character has thus far been represented as an incompetent target for brutal violence. One of the villains' weight and gender performance seem only to exist to convey their grotesque nature.